This week is holiday week for me so I have had time to take it just a little slower than usual. Have you had a moment of rest lately? Rest is important for our minds, bodies and souls. After that philosophical note, let me get back to what you are here for, part 5 of Nuts about Squares CAL. 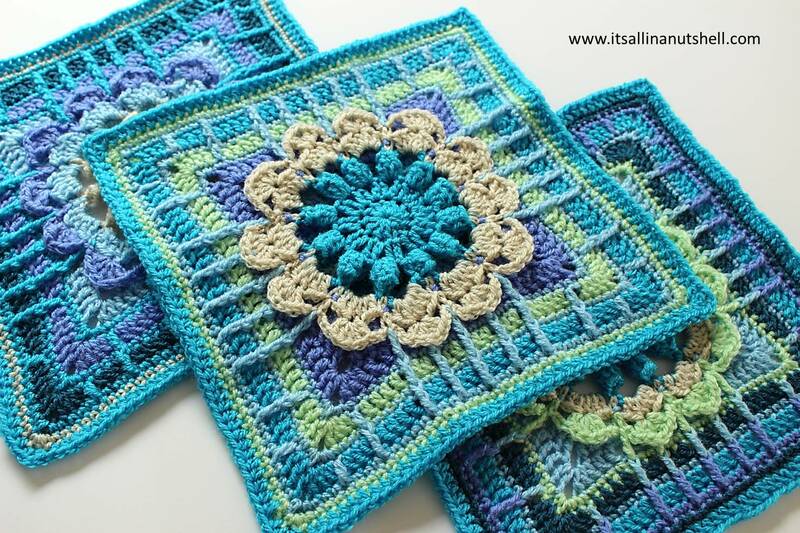 This week a fun floral square designed by Melissa Green. An important note for this week, be sure to go up a hook size. BELANGRIJK. Er was een klein foutje in de Nederlandse vertaling ingeslopen bij Toer 11 en Toer 13. Je moet een Rdst/v haken en niet een Rst/v. Er is een update beschikbaar op Ravelry van het patroon met de correctie. Het patroon staat op Ravelry. Als je nog geen lid bent van dit platform kun je een gratis account aanmaken of als gast een patroon downloaden. Ravelry is een groot platform met duizenden gratis, legale patronen. Click op “Free Ravelry Download” op het patroonpagina en sla de Nederlandse vertaling op. The colors for each row are given in the Color Chart Week 5 for each of the three colorways or you can follow the general colorway in the table below. Update: When testing my testers and I found that Rachel turned out smaller than our other squares and we needed to go up a hook size to get all the squares the same size. However, I notice that some of your squares turn out too large if you go up a hook size. If you suspect that your tension is such that you may end up with a too large square, then don’t go up a hook size. If your square then does happen to be smaller, make Round 15 with dc or tr instead of hdc. Work Rounds 1 to 14 according to the written pattern or video tutorial using the colorway for week 5 given above. Work 3 squares in total. A small tip for round 9: I replaced the tr with a bptr to catch the 3rd dc of the flower petals along the straight edge. This way the petals are secured to the square. The flower petals in the corners remain unconnected. In the video I show how to do this. My squares bobbled quite a bit, so I really recommend blocking this square. Update: Tijdens het testen hebben mijn testers en ik gezien dat Rachel kleiner uitvalt en daarom hebben we een haaknaald groter gebruikt om hem dezelfde maat te krijgen als de vorige vierkantjes. Echter, ik zie dat bij sommige het vierkantje juist groter uitvalt als ze een haaknaald groter gebruiken. Mocht je verwachten dat je vierkantje groter zal uitvallen omdat je bijvoorbeeld los haakt, ga dan niet naar een grotere haaknaald. Mocht hij dan alsnog te klein uitvallen, maak de steken in Toer 15 langer, dus een st/dst. Werk Toer 1 tot 14 volgens het geschreven patroon of gebruik de Engelstalige instructie video met de kleurverdeling voor week 5 zoals hierboven. Maak in totaal 3 vierkantjes. Een kleine tip voor Toer 9: vervang het dst met een RdstA en vang het 3e stokje van de bloembladjes waardoor je de blaadjes vastzet aan je werk. In de video laat ik zien hoe ik dit doe. Mijn vierkantjes waren nogal flink aan het bobbelen en opspannen is echt nodig. If you appreciate a visual support to the pattern, you can follow the video for Rachel. This video shows you how to make the original square. When you have completed your 3 squares and have added the extra row you are all done for this week. WOW! 15 squares already!! My stack of squares is a lovely stack indeed. If you would like to share your work you can do so in the Official CCC Social Group on Facebook, share it on my Facebook page or tag me in your post on Instagram. If you use the hastag #NutsAboutSquares it will help me find it. I hope to see all of you next week for part 6 of Nuts about Squares CAL. Under resources you find all relevant links and information. If you don’t like the project then don’t make it. Sorry but here it says 3 squares but on the Nuts about aquares week 5 you say make 5 squares. Which is correct? Hi Esther!!! I have a question, how come that the ch3`s before and after the petals (Earth Rachel square) look like they are caught somehow. But then on the video they look like they are loose. I really like the look that on the picture on this blog…How can i accomplish that? During testing some of the squares I worked with a ftdtr in stead of a fptr in round 11 (?) and caught the space between the petals. However, this pulled the square inward and we decided not to give it as a tip for the final pattern. If you want to you are welcome to work it like this also. I am loving these challenging squares! I appreciate being able to make three of each, as it means I’m finally comfortable with the pattern for each by the third of the repeated square. 😉 I did find a discrepancy between the written and video instructions for Round 10 of Week 5. The video is correct, so thank goodness for the video! In the written instructions, after the 5 (2 DC, ch 1) between each of the tr of Round 9, it says to, “dc in next 2 sc, ch 1, sk 1 sc, dc in next 2 sc.” If you ch1, sk 1 in between the DCs in that portion of the directions it isn’t symmetrical with the other end of that pattern. The video points this out.